VENTURA — Now in its seventh year, Ventura Harbor Pirate Days looks to invoke the lure of the sea and adventurous pirates with this year’s theme, “Seek Ye Treasure.” Participants are instructed to “hide yer gold and hide yer doubloons,” as pirates will be seeking out treasure at Ventura Harbor Village, from 1-4 p.m. July 21 and 22. Pirate Days offers free family entertainment, and visitors can spot famous pirate re-enactors — such as Capt. Jack Sparrow and Capt. Hook and their crews of scalawags — walking along the harbor promenade. The Port Royal Privateers historical encampment joins the event this year, offering a closer look at the pirates relaxing on shore after successful adventures. Pirate’s Cove Marketplace will be filled with precious wares as the “Pirates for Hire” crew engages the crowds with daily pirate costume contests and a top prize, including a Disneyland ticket. Shipwreck Cove will come to life with strolling musicians, nautical knot tying, dockside tours of the tall ship Bill of Rights, “Aarghbor” Boat Tours, photos with pirates, an enchanted treasure room for kids and a Pet Pirate Costume Contest scheduled for 3 p.m., in which pirate puppies will compete for best-dressed-pirate honors. 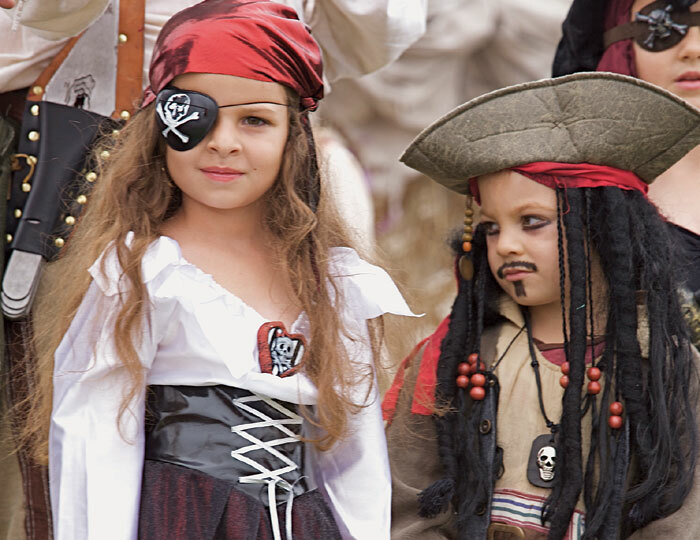 Festival-goers seeking treasures to take home will find village shops featuring pirate merchandise, pirate hats, swords, gifts, eye patches, flags and gear. Purchases of $20 or more at participating Ventura Harbor Village stores will enter buyers in a contest with a chance to win $100 in gold dollar coins. Village galleries will bustle with free activities for children, and restaurants will offer a variety of cuisines and live entertainment. Admission, parking and shuttle buses are free. Pirate Days shuttle parking is located at Schooner Drive and Harbor Boulevard or at Schooner Drive and Anchors Way, from noon-5 p.m. Saturday and Sunday. Visitors can also catch the Ventura Harbor Water Taxi from Marina Park, where kids get free round-trip fare from Marina Park on Pirate Days weekend only. Ventura Harbor Village is located 1583 Spinnaker Drive, off Harbor Boulevard.